My two boys have a serious sweet tooth. They are good about eating a variety of foods, but still come back to wanting sweets. I think they must get it from me, I can go about three days before I start adding sugar to my cheerios. I just can't give up sweets, I've tried unsuccessfully many times. So instead of giving up on making sweets I have been trying to find ways to incorporate fruits and veggies into the sweets I bake. 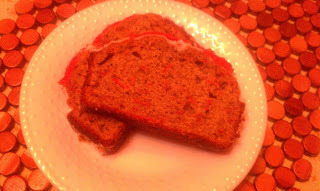 The April issue of Better Homes and Gardens magazine had a recipe for Carrot Bread with Cream Cheese Icing and Candied Carrots that looked like a great way to get more vegetables into my family's diet, while still having the sweets we love. From start to finish this recipe takes approximately an hour and 15 minutes, 55 minutes of which is baking time. There are 11 ingredients in the cake (not including ingredients for the frosting and candied carrots). All of the ingredients I either had in my pantry or I was able to find at my local grocery store. I used ground nutmeg, instead of the cardamon, since I already had it on hand. Additionally, I currently don't own any mini loaf pans, so I just made one large loaf. Everyone in my house agreed that the best part of this bread was the icing and candied carrots. My two boys preferred the cream cheese icing and my husband really enjoyed the candied carrots. The actual carrot bread tasted like a basic sweet bread recipe. I like that it uses 2 cups of carrots, but doesn't taste overally vegetable based. This loaf of bread only lasted about a day, so was well received by everyone in my house and is a great way to get extra vegetables into my sweet oriented family's diet. 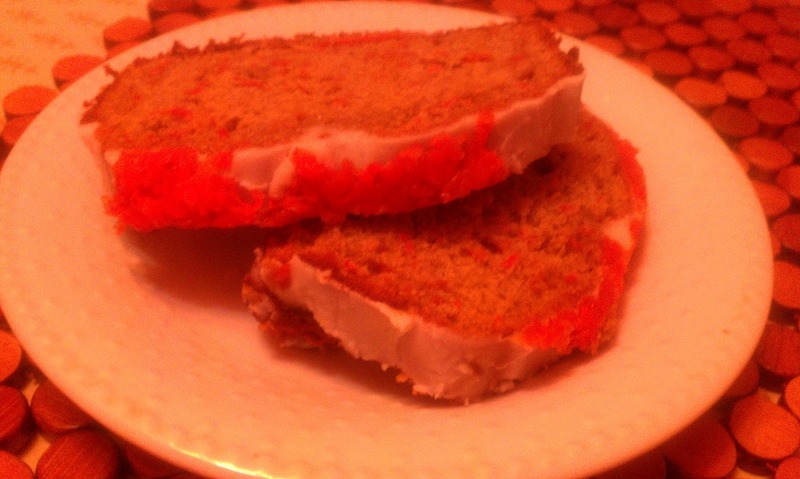 For the recipe go to Better Homes and Gardens Carrot Bread with Cream Cheese Icing . Thank you for sharing. I have a family gathering on Monday and I think this would be a hit. Looks delicious. Thanks for stoppying by my blog. Following you back! We tried this one. As written we thought the recipe was okay, but I made it a second time and made some modifications and I liked it better. @Shanan, My two boys and husband liked the frosting and candied carrots the best. I agree with you that the actual bread just tasted like a standard sweet carrot bread recipe. I experiment with recipes all the time, your modifications looks great!